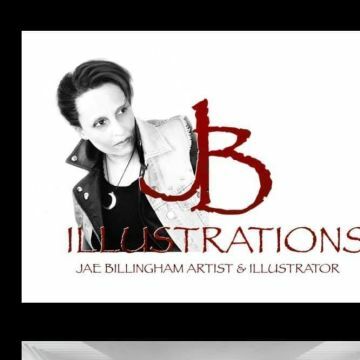 Jae is a professional artist and has spent 6 years traveling the United States being technically trained in the art of human face's. She is a frequent student at Scottsdale Artists School, Arizona and specializes in graphite, charcoal and more recently illustration digital art. As Jae's art expanded so did her love for Fantasy, Gothic and Horror art which resulted in the creation of Gothic Art Studio first, then along came Hear No Evil Art. A deaf artist,( I know right, Hear No Evil, I thought it was cool too). creating artworks from my favourite genre all things horror. Alternative movie posters is what I do frequently and with the collaboration of TalentHouse I get my artwork in front of dozens of movie production companies such as Warner Bros . My art is soon to be featured as sketch cards in trading card sets, and hopefully, will also have my art included in Horror Crates/Boxes. If you attend Horror Cons around the UK then there is a good chance you will see me or my Art there. I am extremely excited about the creation of Jitters TV Channel for Youtube,.The channel will be debuting on Halloween, I am getting some amazing content together as we speak. As with any venture it takes time to build, but, this year so far, has been amazing and things seem to be moving quickly.So stay tuned and keep checking back for for updates because things are moving fast around here.